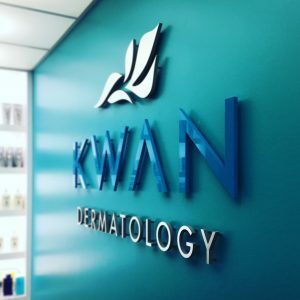 If you’re looking to put your brand’s best face forward in a creative way, dimensional letters are a great alternative to traditional signage. Dimensional letters, often called 3D letters or raised letters, are unlit lettering or designs applied to surfaces in order to create raised images. They are cast, molded, fabricated, or cut from solid material to achieve this effect. Dimensional letters offer what many business owners are looking for: visibility, durability, and a smart, professional look. Precision Sign and Graphics can attest that dimensional lettering is a smart choice for any business. Whether you run a restaurant, hospital, boutique, office, church, bank, etc., our dimensional letters are sure to look good on and in your facility. The raised letters we produce are specially designed to be highly visible so that they help expand your advertising reach. Precision Sign and Graphics also makes sure to use the best materials in the market so that once we install your dimensional letters, you won’t have to keep worrying about them. You can expect them to look good for a long time. 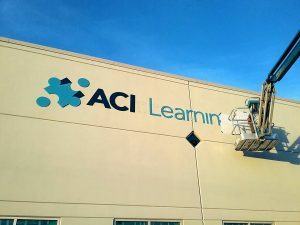 And if that’s not enough, we have an entire team of signage specialists that can take care of sign maintenance for you. Given dimensional letters’ eye-catching appeal, they make the perfect choice for your building’s storefront sign. They give your building more texture and depth, while exuding a more sophisticated feel. The versatility of dimensional letters is also a huge plus. They are usually installed directly to your building’s facade, but they can also be incorporated into monument signs, post and panel signs, and reader boards. Channel letters are a popular alternative to dimensional letters. 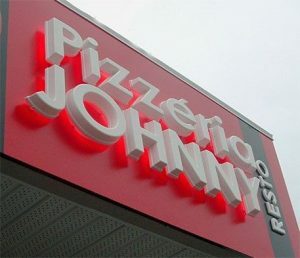 Even though 3D letters are non-illuminated, Precision Sign and Graphics can include spotlights, halo lights, or backlighting during sign installation, so your dimensional letters are visible even during the evening. With our product on your building, your business stands out and your branding message gets delivered, professionally and consistently. Dimensional letters aren’t just for the outdoors; they also give your business a professional ambiance as interior signs. Have them installed close to your reception area and your brand will be the first thing your customers notice as soon as they step inside your facility. Dimensional lobby signs and logos are very common, and can be made in a variety of materials, with options including backlighting, if desired. 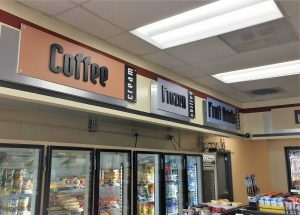 Dimensional letters can also be used for wayfinding and other signage elements to make a big element in retail and convenience stores. 3D letters, contrary to the name, aren’t limited to letters either! You can have letters, numbers, images, logos, or a mix of all that installed on your walls. Precision Sign and Graphics’s team of experienced designers can help build interior signs customized to your business’s specific personality and character. 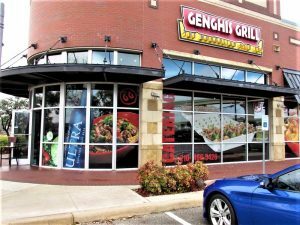 If you desire a dimensional effect that truly makes your brand stand out from your other decor, Precision Sign and Graphics can provide you with dimensional letters that speak your brand. Precision Sign and Graphics produces dimensional letters from many different materials to best suit your brand and business. You have the option to choose between metal, wood, plastic, and light foam as material for your dimensional letters. Plastic is known for its versatility and includes acrylic, PVC, vinyl, and plaques. The durability and weather-resistance of plastic makes it a great choice for outdoor dimensional signs. Metal is a good choice for interior letters because of its classy appeal, but is also very durable when used outdoors. Metal includes aluminum, brass, bronze, copper, and stainless steel. Light foam is a popular option for large, colorful letters. It’s affordable, lightweight, thick, durable, and sturdy. We can help you choose the right sign style and materials to accomplish your desired finished look within your budget. It’s not easy to choose the perfect sign to represent your brand. It takes time, research, patience, experience, and a tried-and-tested production process. With Precision Sign and Graphics, we can assure you that you won’t have to go through all this alone. Our team of experienced sign makers and graphic artists can impart their knowledge to guide you through the sign creation process. Precision Sign and Graphics is here for you as we conceptualize and create designs, we help you choose the best materials for your purpose and budget, we also make sure that your signs are strategically placed and installed, and we are only a call away if you ever need any support or assistance with your signage. Precision Sign and Graphics is highly meticulous when it comes to sign choices and sign quality. We would be more than happy to give you some tips and advice about the perfect dimensional letters for your business. Call Precision Sign and Graphics today at (951) 476-2858 for your Free Consultation with a Dimensional Letters Expert!